Bay Area-founded tech company Broadly.com has expanded to the East Coast with a new office in Fells Point. The Oakland, Calif.-based company, which offers digital tools for small businesses, moved into the third floor of the Union Box Building on Lancaster Street in January of this year. CEO Josh Melick said Broadly plans to host 50 employees at the 7,500-square-foot office, which is its first on the East Coast. Founded in 2014, the company offers tools to help such as web chat, texting and a mobile app to help small businesses communicate with customers and offer an easy way to leave a review, as well as centralize communications for an internal team. For small outfits like dentist’s offices and carpet cleaners, Melick said these tech tools can take the place of a phone call, and go beyond what would be offered on a website. “They need simple and easy to use tools, and they need tools that are really built for them,” said Melick, who said he grew up around small business. His father was a roofer, and he helped bring the contractor business online. Prior to cofounding Broadly, Melick held leadership roles at Demandforce and Ingenio, both of which were acquired. The company raised $22 million to date, and now has about 120 employees. Last month, it acquired About.me. On the West Coast, it also has offices in Los Angeles along with the Oakland headquarters. Melick said the company wanted to “plant a flag on the East Coast” that would help to serve customers and tap into talent. When considering where it would be located, he said, “we spent quite a bit of time talking about different locales.” New York and Philly were among the cities considered, along with North Carolina. “First and foremost, it just kind of felt like home,” he said about Baltimore, adding that the city is “unpretentious” and has a hometown pride that’s similar to Oakland. Melick also pointed to the talent coming out of universities and companies growing in the tech community. There’s also a connection by way of Chris Brandenburg. The cofounder of Baltimore’s IPO’d mobile advertising company Millennial Media is an advisor to the company. Proximity to D.C. helps as well, Melick said. Ultimately the company settled on Fells Point for the office, where there was a historic building available to move into and other development in the area. The team wanted to maintain an office in a walkable, urban environment, similar to its headquarters. 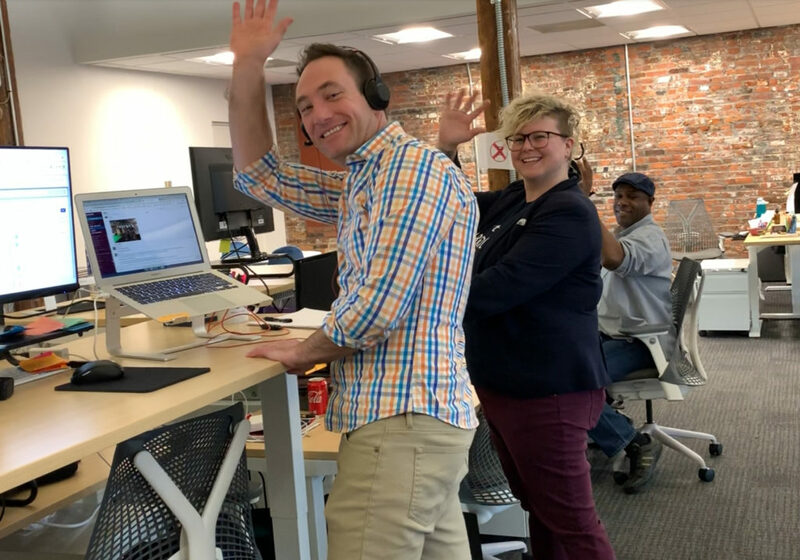 To start the Baltimore office, eight people relocated from California representing different roles found across the company from sales and support to engineering and design — “Frankly, it wasn’t a hard sell,” Melick said. The company already hired about 20 more, and this year the company will look to grow to a total of 50 people with each of those roles represented.